Être à l’ouest | One quality, the finest. I love the French expression être à l’ouest (et-ruh ah luhwest), which means “to be in the west.” As a teacher, I get to see manifestations of this expression on a regular basis. It means to be spaced out or daydreaming. I’m sure that French grammar could not be responsible for the glazed expressions on some faces, nor could the teacher! The little daydreamer in the photo is our daughter many years ago. 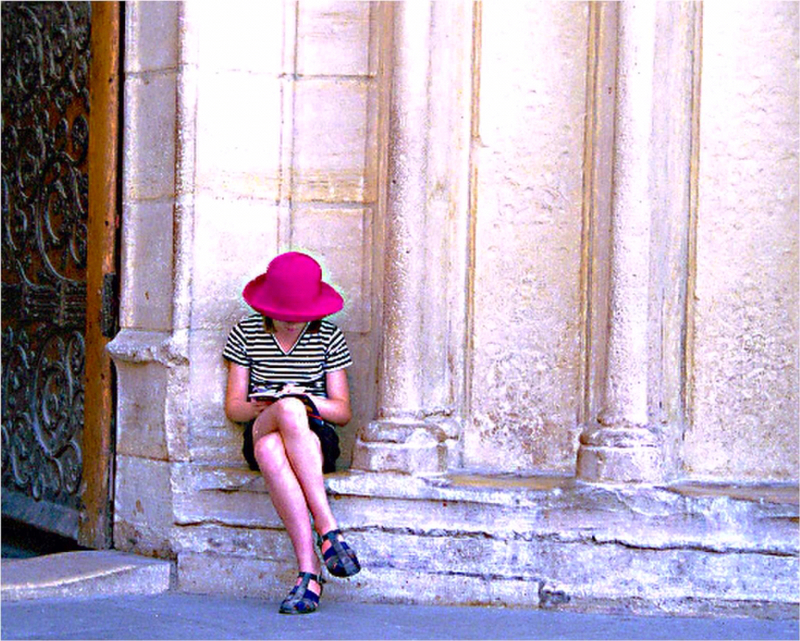 She’s sitting outside Notre Dame cathedral while we were in the line to go up the towers. She passed the time with a little game she made up – picking two locations in the index of Parisian streets and figuring out how to get from one place to another. She was literally à l’ouest as well as every other point on the compass. This entry was posted in Idioms and tagged être à l'ouest, daydream. Bookmark the permalink. love this! you could say this is how I came upon your blog – daydreaming – and now I love this expression. merci mille fois! I’m so glad your daydreams brought you by. Thanks for taking the time to leave a comment.